"The goal is to make the ego as strong and as small as possible." "The experience of the self is always a defeat for the ego." CJSSF: In your book The Way of the Small, you include a charming little box after each chapter with the title "Potent Quotes." They present, in a small font, the quotes that you have chosen to accompany the chapters. The two above quotes by Jung, although not inside the boxes, seem very powerful in regards to the content of your book. Could you explore them and share your thoughts with us? There is a tendency, particularly from the influence of Eastern religion and its occasional misinterpretation by Westerners, to believe that the ego needs to be transcended, that one should be beyond or without ego. That is not only erroneous, but dangerous. You need a strong ego to survive and find fulfillment in life. That is why so much of analysis is concerned with building a strong ego and ego skills. Without a strong ego, one cannot confront the unconscious; one will be overwhelmed by it. Merely, one should have a strong but small ego, meaning that the ego's ambitions, attachments, and inflation ("ego tripping") should be kept to a minimum so that the ego does not get in its own way and obstruct a healthy relationship with the unconscious and the world. That is the way of the small and addresses the first quote. The second quote speaks to how when the ego is made to feel small, often by some diminishing ordeal such as failure, depression, a health crisis, or loss of a loved one, it gets out of its own way so as to have an encounter with the unconscious that leads to some new insight or deepening awareness. The Self—that higher intelligence within the psyche that sends us our most illuminating dreams and guides us to realize our hidden capacities—can then emerge unobstructed. And reversely, when the Self emerges, it is itself a diminishing experience for the ego. The ego recognizes that it doesn't really run the show, that its deepest wisdom is not its own, that it is all too human and frail. Religious experience, which comes from the Self, liberates the ego by defeating it through a realization that it is not the center of the universe, but, like the earth, just a small planet revolving around a much greater source of energy and light (namely, the Self). The realization of the Self always defeats our ego-centricity. Embracing this realization with its defeat is also the way of the small. CJSSF: You mention and quote musicians, among them, Bob Dylan: "I make a song as small or as narrow as possible rather than make it a big, broad, grand thing. By keeping it so narrow, emotion plays a great part." One classic of the Japanese literature is The Narrow Road to the Interior, by Matsua Basho, the story of a man pursuing simple life. Also, in Matthew 7:13 we read: "Enter through the narrow gate. For wide is the gate and broad is the road that leads to destruction, and many enter through it." 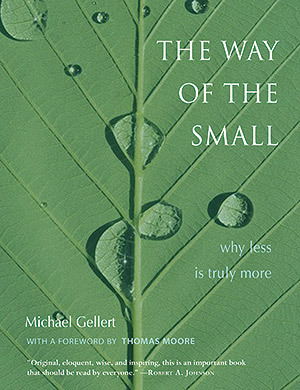 What would be your comments about how the way of the "narrow" is connected to the way of the "small"? The way of the narrow is the way of the small. They're synonymous. "Narrow" alludes to what this path or way looks like when you're facing or traveling it; "small" alludes to the attitude and behavior on one's part when facing and traveling it. CJSSF: Would you recommend any additional reading material to those interested in the topics that your book approaches? There is a comprehensive list of books in the Notes at the back of The Way of the Small. Mystics such as Meister Eckhart and the Zen masters all trumpet the way of the small, as do American masters such as Henry David Thoreau and Abraham Lincoln. One book that nicely "says it all" is the Tao Te Ching; Stephen Mitchell's recent translation is very inspiring.